Want to be notified of new releases in arifwn/pyWRFChemEmiss? pyWRFChemEmiss is a WRF-Chem emission preparation tool. You'll need python 2.7 and wx-python installed in order to use this application. 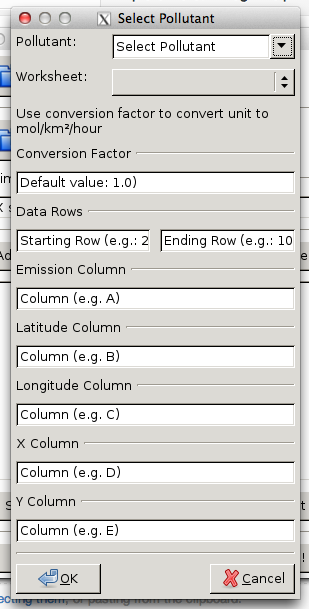 The data source (.xlsx spreadsheets) are typically exported from GIS apps / emission inventory system. x is relative x coordinate of the grid in meter. UTM projection is used during conversion. CO_EMISSION is the emission data. If you're not using mol/km^2/hour as emission unit, put the conversion factor in the "conversion factor" field in the emis_converter.py. 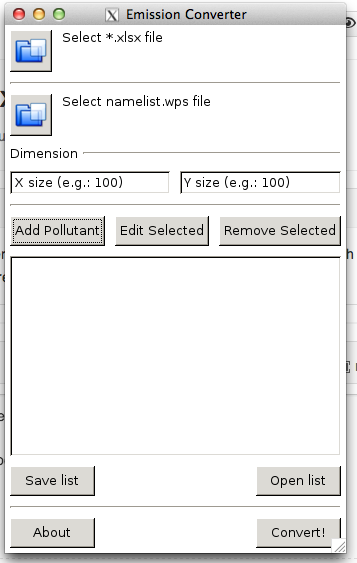 You can put several pollutants at once using "Add Pollutant" button, and save your configuration with "save list" button. After converting the data using pyWRFChemEmiss, you can proceed to run WRF-Chem's convert_emiss.exe and continue with the WRF simulation workflow. Note that I haven't tested this app against the latest version of WRF and WRF-Chem, so it may or may not work.